SugarPea Designs PARTY BANNER DUO SugarCuts Dies SPD00146* at Simon Says STAMP! SPD00146 This item is on reserve until If you would like to reserve this item now, you may purchase it now with the rest of your order. We will hold your order now and ship your entire order as soon as this item is back into stock. If you would like your order to ship now, please place this item on a separate order. Success, SugarPea Designs PARTY BANNER DUO SugarCuts Dies SPD00146* has been shared! This Party Banner Duo adds an element of festive fun to any of your card making or paper crafting occasions. This die set features a solid and outlined banner. Each banner is slightly curved and fits across the front of an A2 sized card front. Use separately or pair the banners together to create a fun layered accent. And to make creating a breeze check out the It’s A Celebration Patterned Paper Collection (sold separately) for quick, easy and professional paper crafting projects. Wendy Ramlakhan is the owner of SugarPea Designs, a family operated clear stamp boutique specializing in the SWEETEST stamps on the market. After many years of working as a designer for various stamp companies, teaching her own Copic instruction classes and having her work published in several trade magazines, Wendy decided to take a leap of faith and live out her passion for stamping and paper crafting and launch her own stamp company. Sugar Pea is a nickname Wendy gave to her daughter when she was an infant. So it seemed only natural to use the name for the company since Wendy's children are her biggest inspiration. 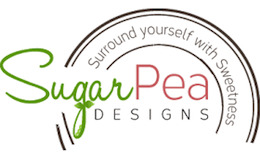 SugarPea Designs is looking forward to a bright future.